The earliest feature excavated during the Summer of 2014 was a ?ditch beneath a layer, which we nicknamed ‘crunchy red’ on site. This little ditch produced a handful of fragments of rock. It was immediately apparent that these fragments of rock were igneous and thus were thus imported to the site (the local geology is sedimentary). The first are the dyke intrusions at Cheddon-Fitzpaine, 20km to the NW near Taunton, described as a Lamprophyre and seen at Yarford villa as rubble . Further away in Devon (40km) there are Early Permian intrusions and Volcanics from the Exeter Volcanic Series. These were identified in rubble fragments from the nearby Late Iron Age to Roman excavations at Montacute. Saddle quern in a pinker granodiorite was also recorded from later 2011 excavations at Montacute where a Cornish source is suggested as was a basic spotted dolerite macehead from these excavations. All bear some similarity to the fragments from Barrow. The stones are likely to be part of a prehistoric object. We need to look carefully at the pottery from the ‘crunchy red’ and other early deposits. 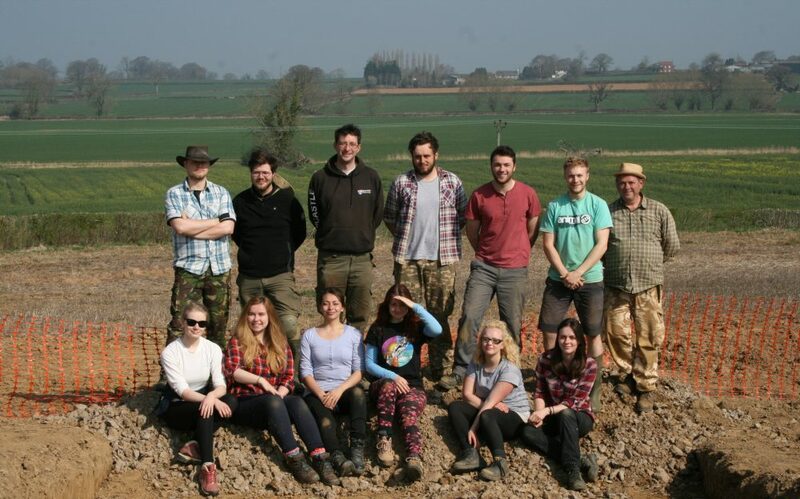 Nevertheless the geological report has confirmed that we have a long stratigraphic sequence at Barrow, running from prehistory through to the medieval period.